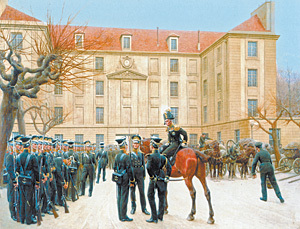 Guards Company in Paris in 1814. Painting by Ivan Rozen, 1911. When creating his Navy, Tsar Peter I knew that at sea, besides seamen, one also needed soldiers for assault action on shore. The scattered former boarding teams were not suitable for the new tasks. With his typical grandeur, Peter charged the General Admiral Fedor Golovin with creating a unified marine regiment. The latter gave the respective order to the Vice Admiral Kruys on November 16, 1705. This date marks the beginning for the count of the glorious years of the Russian Naval Infantry. Even the great past cannot consist of only victories and successes. One can also learn from mistakes of the past days. The first years of the marines’ existence were far from rosy. The responsibility for the marines was split half-and-half between the land and the naval military departments. As a result, each of the departments strived to avoid their responsibilities, and soldiers were missing basic necessities. Not only was the salary not paid in time – even the military uniforms were not provided. Had it not been for the Tsar Peter’s efforts, the marines would have ended up stuck somewhere between the land and the sea. The Tsar’s efforts paid off in the battle of Gangut on July 27, 1714. The regular Russian Naval Infantry was “baptized by fire.” With participation of the Galley Squadron battalion, 9 Swedish flotilla vessels were captured, including the flagship, the 18-cannon pram Elephant. On May 24, 1719, the first battle of the Russian sailing fleet in the open sea took place. Captain of the 2nd Rank Naum Senyavin’s squadron attacked the Swedish ship, the frigate, and the Captain Commodore Wrangel’s brigantine, and forced them to surrender. The outcome of the battle was decided by skillful maneuvering and well-aimed cannon fire, but the marines played their role, losing three people. In 1720, the Navy Regulations came out, defining the seamen’s and the marines’ position in the Navy. This fundamental document, developed under the guidance of Peter I, turned out to be so successful that it was used, with a small interruption, for more than a hundred years. In general, Peter’s reforms were many years ahead of the Army and Navy’s development. For the first time in 1719, the regular Naval Infantry received special color uniforms, made of cornflower blue cloth. However, these were worn on special occasions only, and the regular sailor’s tunic was still the everyday’s uniform. The Russian Naval Infantry made its first appearance in the Black Sea basin in the spring of 1736. The free battalion, recruited from two regiments, together with the Don Army of General Pyotr Lacy, went to fight the Turks to regain Azov. The mission stretched over several years. The year after taking the fortress, the Don Army undertook an unprecedented march to Crimea following the narrow Arabat Spit. In 1738, the battalion, together with the ships of the Don Flotilla, sailed out on boats. But this time, the Turks were prepared to meet them. Their fleet blocked the Russian boats by the Fedotova Spit. In two days, the soldiers dug out a canal 8.5 m wide, dragged 119 boats over and re-buried the canal, blocking themselves from the enemy’s ships. But in a week, Turkish fleet rounded the Spit. The soldiers then grounded the boats, built batteries, and prepared for defense. For a month they exchanged fire with the Turkish ships. Since there was no way to break through by water, on June 15 the boats were burned, cannons sank in the sea, and the army headed for Azov by land. On August 8, 1738, having passed through low water steppes, the marines arrived at the fortress. They made part of its garrison until 1741, then returned to Petersburg. As a result, by the commencement of the Russo-Swedish War of 1741-1743, the marines fell into decline. Moreover, the most experienced ones, the “battle-seasoned naval veterans,” were transferred to serve as seamen. As a result, the ships had to carry regular infantry soldiers. This is what happens when the army is not used as intended. Only with the help of field infantry was it possible to carry out successful campaigns against the Swedes in the years 1742 and 1743. However, as a result of a palace coup, Catherine II, a pure blood German, who, in contrast to her German-loving husband was a patriot of Russia, gained the throne. This marked the beginning of the Catherine’s Golden Age. As is the tradition for the Russian Nation, beginning of a new rule was marked by yet more reforms. Yet another committee for setting order to the “Russian fleets and the Admiralty” was formed. On March 22, 1764, the Empress approved new staff positions for the Baltic Fleet. From now on, the marines’ purpose was to serve on ships only; the Galley fleet, in case of war, was supposed to be staffed by the soldiers of the Army regiments. As a result, the numbers of the marines grew to 8,100 people. By this time, the new Russo-Trukish War had started (1769 – 1774), and the Russian marines, for the first time, sailed out into the deep seas. As part of the Admiral Spiridonov’s squadron, 1,006 marines (soldiers and officers), reinforced by three hundred men from the Keksholm Infantry, headed for the Mediterranean. The voyage from Kronstadt to Greece took the Russian squadron seven months. Over this time, disease claimed the lives of 400 seamen, soldiers, and gunmen. After gaining Port Vitilo, two Spartan Legions were formed with the local inhabitants. While some fortresses were seized, somewhere else a retreat had to be made under the pressure of the superior Turkish forces. A marines’s company, equipped with four cannons and two “unicorns,” was formed for seizing the Modon fortress. They were joined by the “Spartans,” 800 Greeks and 100 Albanians, under the command of the Prince Yuriy Dolgorukiy. But once the mighty Turkish corps had arrived, the “legioners” took flight. 500 marines remained, face to face with 8 thousand Turks. Fighting, they began to break through to their own in Navarino. 150 soldiers and a captain were killed, 250 – wounded. One former service corps officer, Polyansky, demoted to common soldier “for inadvertence," distinguished himself in battle. He hid two banners on his chest, continued fighting and was wounded in his leg. Not able to walk, he passed the banners to the General Dolgorukiy and to the Second Major of the 1st Naval Battalion. For his heroic deed he was returned to his former officer rank. The principal events of the campaign of 1773 were the battle by the Sirian coast and the two-month long siege of the Beirut fortress. From June 23 to September 29 of 1773, a large Russian landing party (around 1,000 people) engaged in military action on what is today the Lebanese coast. After the surrender of the fortress, the marines stayed in Beirut until January of 1774. During this campaign that lasted for years and was marked with quite a number of battles, all the marines were awarded with silver medals inscribed “To the Victors.” This was the first soldier award on a ribbon of the just established military Order of Saint George. The Mediterranean expedition had one unexpected consequence. Thousands of local volunteers, Greeks, Albanians, Serbs, Montenegrins, joined the ships. In the beginning, they were all called the Albanians, or as Turks called them, the Arnauts. But later the Greeks insisted to be called according to their nationality. After the conclusion of the Treaty of Kuchuk-Kainarji in 1774, the sons of Hellas, together with their families, were brought to Russia. The Tsarina allotted them residence in the Crimean fortresses of Kerch and Yenikale. Hence, the naval fleet was reinforced with experienced fighters, although, in the peace time, they could not be used “outside their scope.” Later, Greeks were also allocated a place near Taganrog. In 1777, the Crimean Tatars started an internecine war. Russia supported the Khan ?ahin Giray in his struggle with the pro-Turkish opposition. Here, too, the Albanian army showed their worth. The Greeks and the Arnauts showed they deserved the privileges and the benefits they were given. Later on, they were formed into a Greek Infantry Regiment. In 1788, the wives of the regiment’s officers formed an Amazon Company, the first female unit in the Russian Army. This was one of Potemkin’s surprises for Catherine II, who visited Taurida and the Crimea. With the beginning of the Russo-Turkish War (1787-1791), the Greeks again found themselves in the zone of military action. A company of volunteers successfully attacked the Turkish merchant ships and accomplished other heroic acts. The following year, a full-fledged corsair flotilla was formed in Taganrog. Potemkin wrote to the Empress: “The cruising Greeks join bravely and readily. It would be good if our marines were like them.” But they didn’t just cruise, they also acted as landing forces, for instance, on 22 of April, 1778, in Constan?a, which they burned considerably. England and France were not the only nations to have privateer ships. Lieutenant Lambro Dmitrievich Kachioni (Lambros Katsionis), commissioned officer for his valor, received in 1788 a “privateer license,” outfitted a ship using the money of the Greek community of the Austrian Trieste, put a team together and went to fight the Turks in the Archipelago. In October he came back to pass the winter, already having 9 ships and around 500 volunteers. He named his captured ships Velikiy Knyaz Konstantin (Great Duke Konstantin), Knyaz Potemkin-Tavricheskiy (Duke Potenkin-Tavricheksiy), Graf Aleksandr Bezborodko (Count Alexander Bezborodko), and so forth. Kachioni fought the Turkish Navy, the Algerians and their allies, and captured fortresses and islands. Only the superior forces of the Turks and the Algerians, attacking one day apart, robbed the Russian Corsair of 5 out of 7 ships. He was wounded himself. The Empress promoted the brave Greek to General and awarded him with the Order of Saint George of the 4th Degree. His war was not finished with the conclusion of armistice. He continued to act in the Mediterranean with a squadron of 22 vessels. Only a powerful Turkish fleet, with the support of French ships, could break his resistance. For three days, the enemy stormed his base Porto-Kayo with superior forces. The Greeks scattered. In the night, Kachioni slipped out on a skiff and continued his service already in Petersburg. He is regarded a national hero in his historical homeland. Incidentally, 300 Greeks from his flotilla settled in Odessa. The Greek battalions that included the settlers took part in battles more than once. Thus, the Balaklava Battalion took part in all the landing party operations of the Russo-Turkish War of 1806-1812. The battalion Commander Revelioti reached the rank of Major General. In the summer of 1812, he, still a Lieutenant Colonel, scattered the insurgent Tatars who rebelled after Napoleon’s invasion. One of the most outstanding heroic deeds of the Russian marines was the storm of the Corfu fortress. This story is well known; it’s only worth noting that the Russian losses (the Turkish allies refused to participate in the storm) in the furious fight amounted to: 1 lieutenant, 2 non-commissioned officers, 7 grenadiers, and 15 fusiliers. There were a little over 40 wounded. Nevertheless, in the Soviet movie about the Admiral Ushakov’s squadron’s campaign, “Ships Storm the Bastions,” Russian blood literally flows like water and the killed fall by dozens. The Russian marines' distinction was that they fought bravely and skillfully, and therefore sustained much less casualty than the opponent. Altogether, the squadron’s ships carried 2,056 servicemen of the Black Sea Fleet battalions. On June 3, 1799, Lieutenant Commander Belli’s landing forces attacked the Saint Magdalene Bridge in Italy, and, losing three wounded, captured a 6-cannon battery. Pursuing the French, the marines entered Naples. In the meantime, an enemy’s 1000-men strong column approached the Russians from the rear. Belli sent Lieutenant Alexander to meet it, with 100 soldiers, 30 seamen, and 2 weapons. After several gun shots had been fired, the party charged with the bayonets. In the course of a four hour battle, the non-commissioned officer Roman Linev "had the fortune of taking from the enemy’s crowding army their banner,” for which act he was later made Lieutenant by Pavel I. 300 Frenchmen were killed in the bayonet fight by the marines, 60 men and 5 cannons were captured. The marines lost 3 people and 8 were wounded. A company with barely 500 fighters liberated the entire kingdom of Naples. Emperor Pavel at once conferred the rank of Captain of the 2nd Rank on the Lieutenant Commander Belli and awarded him with the Order of St. Anna of the 1st Degree, in status – a general's award, a unique case in the history of the imperial award system. 7 non-commissioned officers of his company were made lieutenants. Yet another reform of the naval department resulted in creation on February 16, 1810, of a Guards Company. The following year, in wait of the war with Napoleon, the marine regiments were included in the infantry divisions to prepare them for combat activity on land. During the Great Patriotic War of 1812, seamen of the Guards Company took care of water crossings, destroyed stores of provision and watermills. They also built crossings over the numerous rivers by Borodino, then, under the enemy fire, destroyed the bridges over Koloch, preventing the French from attacking in this sector. When the invaders were chased away past Berezina River, the bridges had to be built again, with the seamen often working in ice-cold water. Seamen were getting cold, sick, and dying. Throughout the war, 22 men of the Guards Company were killed and 31died of wounds and disease. After crossing the Niemen, 170 people had to be left in the hospitals. On may 9, 1813, the day of their company celebrations, the guardsmen fought stoically by Bautzen. Then there was the battle of Kulm, at the end of which, the commanding officer of the French, the General Vandamme, surrendered to the Captain of the 2nd Rank Kolzakov, else he would not be able to save himself from the Cossacks. At Kulm, 75% of officers and 38% of low rank men of the Guards Company were wounded or killed. The Guards Company was the first of the Russian Navy to receive the St. George’s Flag. The Prussian king also awarded all the guardsmen with the decoration of the Iron Cross. In 1910, the Iron Cross became the basis of the regimental badge of the Guards Company. The marine regiments were involved in action in various battlefront sectors, took part in many battles, besieged Danzig, and seized Paris. The book describes in detail, how the seamen of the 47th Company and the frigate Aurora prepared for defense of the city, built batteries and trained clerks for gunnery (due to a shortage of people). Part of the garrison consisted of recruits from infantry regiments who had already served for four years and many of whom used to be Siberian hunters. The first bombardment of Petropavlovsk was done by six Anglo-French ships that had just arrived, on August 18, 1854. On August 20, several hundred allies landed on the shores, and soon the French were occupying the battery abandoned by the Russians. But at this moment, they were mistakenly hit by well-aimed fire from the English steamship, followed by an even better-aimed gun fire from the Aurora and the transport ship Dvina. Seeing the approaching forces of the garrison, the landing party quickly returned to the ships. After the exchange of artillery fire, having sustained some damage, the enemy ships were about to retreat, but then managed to capture two seamen from the American vessel on the shore not far from the city. The seamen told them about a convenient road, leading to Petropavlovsk from the rear. At the dawn of August 24, 676 people landed on the shores. The English straddled the Nikolskaya Hill, from where all of Petropavlovsk lay open to eye. They had to be counterattacked. One of the enemy’s (French) units swooped around the flanks but was met by the clerk-gunners and a group of Cossacks. Due to the shortage of cannonballs and case shots, the cannons were loaded even with nails. The maneuver failed and the English on the hill, lacking support, ended up hostages of the situation. Another group of Frenchmen moving along the shore came under fire. Losing several people, it ascended the hill, joining the English. Gradually, the Russian units were also flowing in, gathering 267 people against 500 allies on the eastern slope of the mountain. A small unit under the Sub-Officer Mikhailov ascended the northern slope, unnoticed, and found itself in the very midst of the enemy. Recruit Suntsov killed an officer with his very first shot, who turned out to be the landing party commanding officer Parker. A vehement hand-to-hand combat broke out in the thick bushes. Detailed descriptions of the battle and names of those who distinguished themselves are preserved in the reports: Stepanov, Yakovlev, Kislov, Non-Commissioned Officer Abubakirov, Seaman Biknei Dindubaev, Seaman of the 1st Rank Khalit Saitov who killed three enemy men with his bayonet. Not familiar with the area, the allies were falling to death from the steep slopes. When trying to evacuate, they ended up in plain site and sustained losses from well-aimed small arms fire. 16 local volunteers Kamchadals, who “typically aim to hit beavers in the head to avoid damaging the fur,” did an especially good job selectively hitting officers and sergeants. Lieutenant Burasse, commander of the landing troop vessels, was killed. The five-hour battle ended in total defeat of the aggressors. The Petropavlovsk victory became that rare case of a victory not disputed abroad. And no one tries to come up with deceitful excuses for failure.